Virtualization aids the computer system to perform various tasks at the same time. IT virtualization basically tricks the operating system and makes it ready and prepared to perform different required tasks at a certain time period. This makes the overall performance speedy and desirable. Virtualization basically classifies the logical servers of the computer in to various servers which then carry out multiple tasks at the same time. The task of each server is supervised by virtualization, so that every server carries out its own task perfectly. Virtualization is classified into different types on the basis of the functions it performs. Storage virtualization is used by small businesses in order to store their day to day work conveniently. Storage virtualization keeps the hard drive in one place and then day to day data is stored in a very reliable manner. This way, the administrators find it easy to work on all the networks available at a single time. There is another kind of IT virtualization named as Network virtualization, in which hardware and software are combined together to form a virtual network. What the administrator does is that he divides the network in various channels and then these are distributed among the bandwidths. Entire network is streamlined this way, thus saving considerable time. Network virtualization makes it easy for the administrator to handle and observe the entire work of all the networks at the same time. Another most famous kind of virtualization is server virtualization. The main server divides the servers in to different channels and then each server carried out its allocated task in separate spaces. Physical servers are utilized in this case, which further produce virtual servers for performing different computing tasks for the business. As different tasks are performed by different servers at a particular time; therefore, cost of the firm is reduced and machines utilize less power and time. Overall cost is reduced and profit is maximized because of the extra work done in a short time period by the servers. In addition to these functions, servers are also able to carry out the tasks of diagnose and reparation as well. 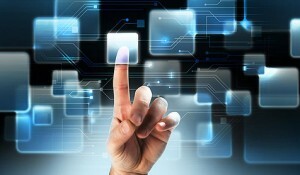 Firms choose their desired kind of IT virtualization by trying out some applications first. They choose the one which is according to the requirements of their business. All firms, either small or large, make complete use of IT virtualization because of its enhanced applications and computing functions. All in all, IT virtualization makes business computing and data storage easy for the administrator. Cost of the business is reduced and profit maximization goals and objectives are accomplished using this technique of IT virtualization.